Perhaps nothing more illustrates the shifts in the global economy than the geography of the largest airports. In 2000, world air passenger statistics were dominated by high income world economies. 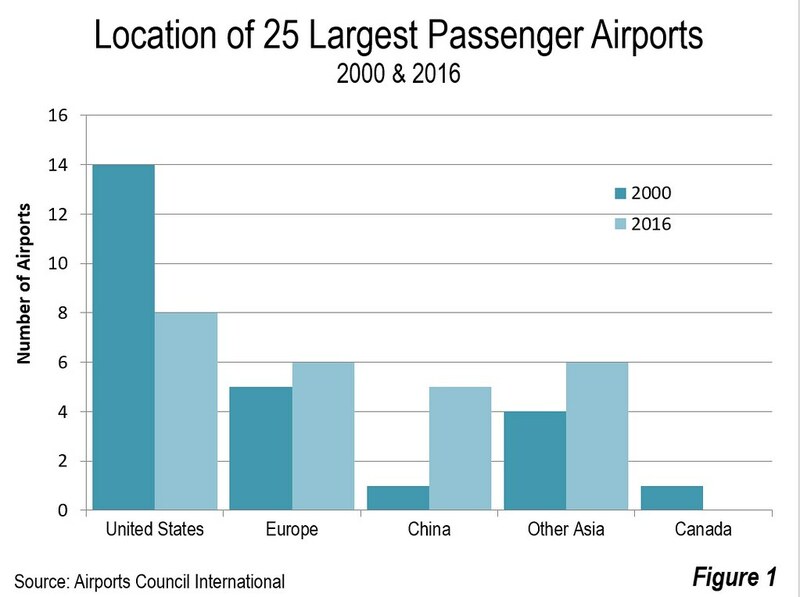 Among the 25 busiest passenger airports, 14 were in the United States, five in Europe and five in Asia and one in Canada, according to data from the Airports Council International and the Port Authority of New York and New Jersey. Among the largest airports in 2000, all but Bangkok were in a high income economies. Things have changed significantly. Today, only eight of the largest airports are in the United States, six in Europe, and five in China and six in Asia outside China. Airports in middle income countries --- largely not on the list in 2000 --- come from Beijing, Shanghai, Guangzhou and Chengdu in China, Kuala Lumpur in Malaysia, and Turkey’s Istanbul (Figure 1). Since 1998, Hartsfield-Jackson International Airport has been the busiest passenger airport in the world, after it replaced Chicago’s O’Hare International. In 2016, the airport handled nearly 104.2 million annual passengers. This is quite an accomplishment for an urban area that is only the 81st largest in the world. Since 2000, Atlanta’s passenger count has increased 30 percent. Yet, Atlanta has been challenged in recent years by Beijing Capital City International Airport, which was substantially remodeled and enlarged for the 2008 Olympics. Beijing handled 94.4 million passengers in 2016. In 2000, Beijing Capital City International was not among the world’s 25 largest airports but has experienced a 335 percent increase in passenger use. Capital City could pass Atlanta in the next few years, but will soon thereafter split air traffic with the Beijing-Daxing International Airport, due to open in 2019, probably making any number one ranking temporary. In the long run, local officials expect Beijing-Daxing to be the busiest in the world. The new airport will be located south of the city and far better situated for access from the entire Jin-Jing-Ji megacity complex, around which many of the current functions of Beijing are being dispersed. Jin-Jing-Ji includes Beijing, Tianjin and much of the northern part of Hebei province. Construction progress can be viewed at this location on Google Earth: 39°30′52″N 116°24′25″E (copy into the Search box or a “’Google” search will bring up the location on Google maps). Dubai International Airport, the world’s third largest airport, has seen its passenger traffic growth much faster than even Beijing Capital City International. Dubai saw nearly 600 percent growth from 2000 to 85.7 million passengers. In 2000, Dubai International was not among the world’s 25 largest airports. 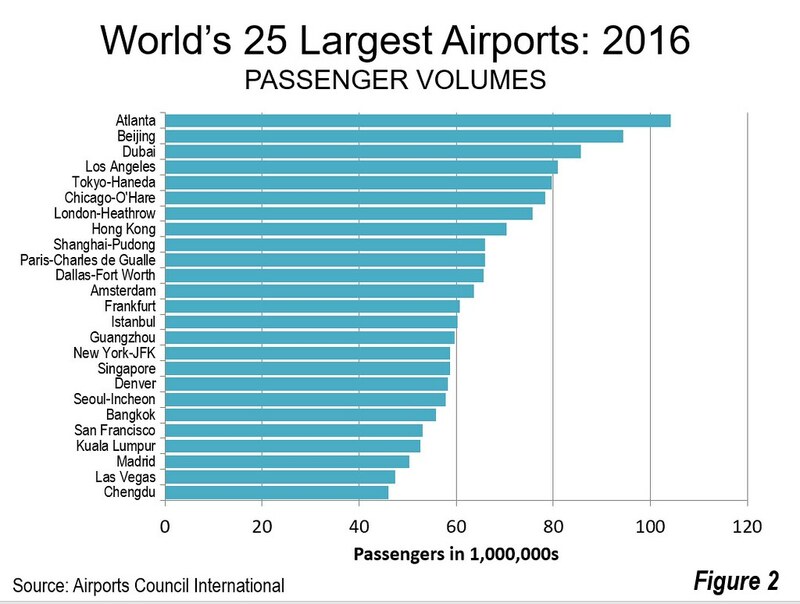 Los Angeles International is the world’s fourth busiest airport. LAX handled 80.9 million annual passengers, up 22 percent from 2000. Tokyo’s centrally located Haneda International Airport ranked fifth, with 79.7 million annual passengers. Haneda has grown strongly, up 42 percent since 2000, when it ranked 6th. During that time, Japan’s regulators have allowed a considerable increase in international flights. Haneda’s overall volume is approximately twice that of far more remote Narita International Airport, which handles most international flights. Chicago’s O’Hare International Airport was the world’s busiest as late as 1997, but has fallen to sixth most patronized. O’Hare handled 78.3 million passengers in 2016, with its strong United Airlines and American Airlines hubs. However, O’Hare’s growth has been modest, adding only 8 percent to its 2000 volume, when it ranked 2nd to Atlanta (see photo above). London’s Heathrow Airport ranked 7th in the world, with 75.7 million annual passengers. Growth was also somewhat muted, Heathrow’s volume grew 17 percent from 2000 to 2016. Hong Kong has experienced considerable growth after having closed its obsolete Kai Tak airport in the late 1990s. Hong Kong International has experienced a 115 percent increase in passengers since 2000 and handled 70.6 million passengers in 2016. In 2000, Hong Kong was the 22nd busiest airport in the world, compared to its 8th ranking in 2016. Shanghai’s Pudong International Airport experienced the largest handled 66.0 million passengers in 2016 and was not among the top 25 in 2000. The world’s 9th ranked airport opened in 1999 and is served by the world’s fastest train, a Mag-Lev (magnetic levitation) that carries passengers 19 miles (30.4 kilometers) to the Longyang Road station at a top speed of 268 miles per hour (431 kilometers per hour) during weekday peak periods. By comparison, the fastest high speed rail trains in the world will operate at up to 218 miles per hour (350 kilometers per hour) between Shanghai Hongqiao Station and Beijing starting this month. From Longyang Road station travelers can transfer to taxis or Metro Line 2 to complete the final 7 miles (12 kilometers) to People's Park in the central business district, or to other locations in the area. Charles de Gualle International Airport in Paris ranks 10th, handling slightly fewer passengers than Pudong International (65.95 million). CDG’s volume is up 37 percent since 2000, when it ranked 8th in the world. The 11th through 16th positions include Dallas-Fort Worth, Amsterdam, Frankfurt, Istanbul and Guangzhou. Istanbul has seen its passenger volume increase more than 300 percent since 2000, while Guangzhou has exceeded 360 percent. The next five (16th through 20th) include New York’s JFK, Singapore, Denver, Seoul’s new Incheon Airport, and Bangkok, also a relatively new facility. Singapore has had the greatest growth, at 105 percent. The final five of the top 25 include San Francisco, Kuala Lumpur, Madrid, Las Vegas and Chengdu. Kuala Lumpur’s growth was more than 250 percent, while Chengdu posted the largest gain, at more than 730 percent (Figure 2). A number of US airports that were among the top 25 in 2000 dropped out over the next 16 years. These include Seattle, Miami, Phoenix, New York La Guardia, Orlando, Houston, Newark, Minneapolis-St. Paul, Boston, Detroit and St. Louis. All of them experienced passenger increases, with the exception of St. Louis, where traffic was down more than 50 percent, with the demise of the American Airlines (former TWA) hub. Toronto’s Pearson International also dropped out of the top 25. The world is flying more and more, According to World Bank data, the volume of air passengers increased 120 percent between 2000 and 2016, with a nearly 7 percent increase between 2015 and 2016. As airline use increases, significant airport construction is underway. Istanbul is building an airport intended to have the highest passenger capacity in the world (41°15′39.97″N 28°44′32.54″E), claims mirrored by Beijing-Daxing and expanding Dubai World Central-Al Maktoum International (24°55′06″N 55°10′32″E). Mexico City will replace aging Benito Juarez International (19.5°N 98.9975°W construction not yet evident), while two cities in China are also building new airports. Dalian is constructing an off-shore facility (39°06′32″N 121°36′56″E) while Qingdao (36°21′43″N 120°5′18″E)is building one in the exurbs, which will be reached from the central business districts with a trip over the Jiaozhou Bay Bridge, the world's longest over-water bridge (25 miles or 41 kilometers). Berlin’s notoriously behind schedule Brandenburg (Willy Brandt Airport) continues to struggle toward completion (52°22′00″N 013°30′12″E). Meanwhile, with the exploding volume of passengers in Chengdu, construction is starting on a new airport more than 30 miles (50 kilometers) away (30.319°N 104.445°E). The rise in air traffic suggests rising affluence, particularly in developing countries, as progress continues to be made in reducing poverty. It seems likely that by 2030, the list of the largest airports will include fewer from today’s most affluent economies and many more from emerging economies.